I can’t say I totally buy the trope of deals with the Devil. If you actually believe in Satan, you presumably also believe in all the Heaven and Hell stuff, and is there any case where being tortured eternally is worth being temporarily rich and powerful? And if you don’t believe, surely the pact isn’t valid, right? I know there’s a certain amount of caveat emptor involved when signing any contract, which is why you’re supposed to read before signing, but you still have to have some idea what you’re signing for it to be legally binding. I guess that depends a lot on your lawyer, though, and Satan has pretty much always been associated with lawyers. And from the Devil’s point of view, why is he putting so much effort into obtaining individual souls? I’m sure he already has more than he knows what to do with. And under some Christian dogma, most people are going to Hell by default anyway. Even Jack Chick addressed that, although he has Satan making people sign contracts anyway, because…he’s a traditional, I guess. It’s part of how the current image of the Devil and Hell are rather quaint. There are believers who think Satan is the opposite of God, a being of limited but still cosmic-level power, with a hand in pretty much everything. 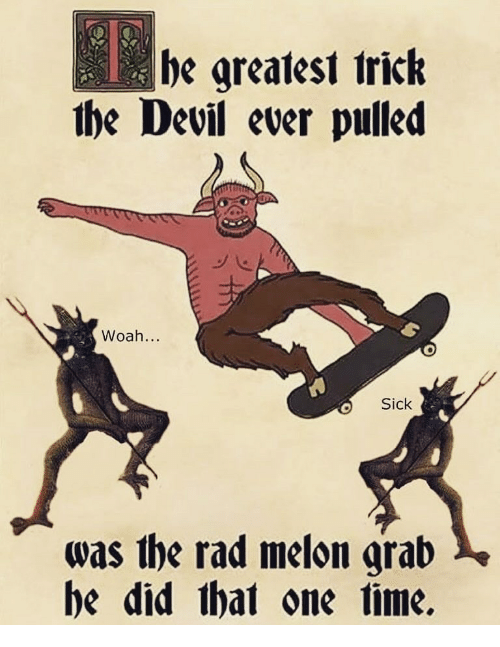 Then there’s the Devil of folklore and popular culture, who’s more of a trickster figure, messing with people just for fun and sometimes being hoisted by his own petard. 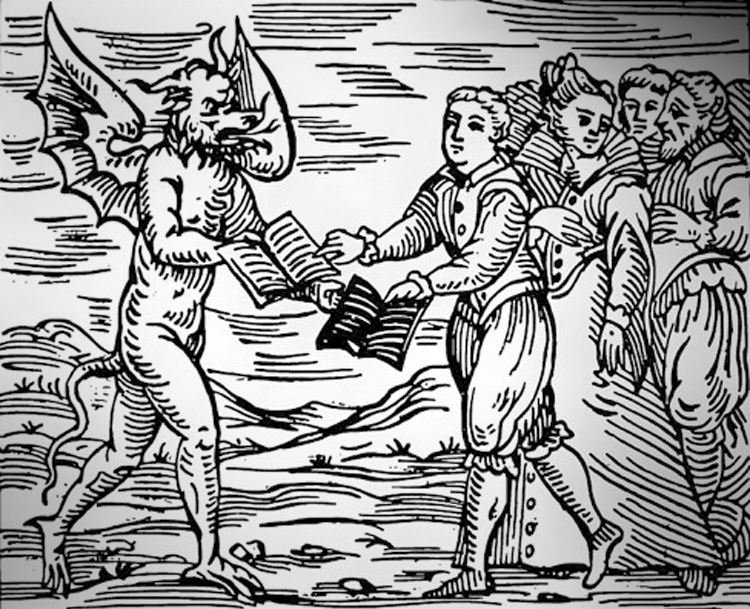 I wouldn’t want to make a deal with either characterization, but I get the impression that some people would think they can outwit Satan, and there is some precedent for that. But wouldn’t the Father of Lies be wise to that kind of thing? That depends on the story, I suppose; some have Satan being tricked but still coming out on top in the end, or at least being able to screw someone over. They might also get off on a technicality. Some stories of this variety have the signer going to Heaven in the end anyway, because they’re essentially good and their sins were forgiven. The Faust tale is one of the most famous accounts of a pact with the Devil, and while earlier versions always had him dragged off to Hell at the end, Goethe had him saved because he still cared, was still striving, and the woman he seduced interceded on his behalf. I was never able to get through the whole thing, but my general impression is that Goethe’s Faust was less someone who sought power or pleasure (although he did obtain both), but rather someone seeking knowledge by any means necessary, certainly a more sympathetic goal. Faust appears to have named after a real person, Johann Georg Faust, a German alchemist and astrologer born in the fifteenth century; but there’s some doubt that he ever really existed. The legend is said to have been heavily influenced by Simon Magus, as well as by St. Theophilus of Adana, a sixth century cleric who was unfairly deprived of his position as archdeacon and made a deal with Satan to get revenge. Like Goethe’s Faust, he was eventually repentant and forgiven of his sin, at least according to the legend. I think that, as weird as the idea is, there are probably people who would agree to it, in light of all the people who have made bargains with Donald Trump. Obviously Trump isn’t Satan, as he’s much less classy and intelligent, and even John Milton wouldn’t be able to make him sympathetic. He apparently doesn’t have the power to consign souls to Hell, but anyone who’s okay with keeping kids in cages is probably going there anyway. Not that I believe in Hell, but a lot of Trump’s allies claim to be devout Christians. But no, Jesus is presumably more concerned with gay marriage than with racism. 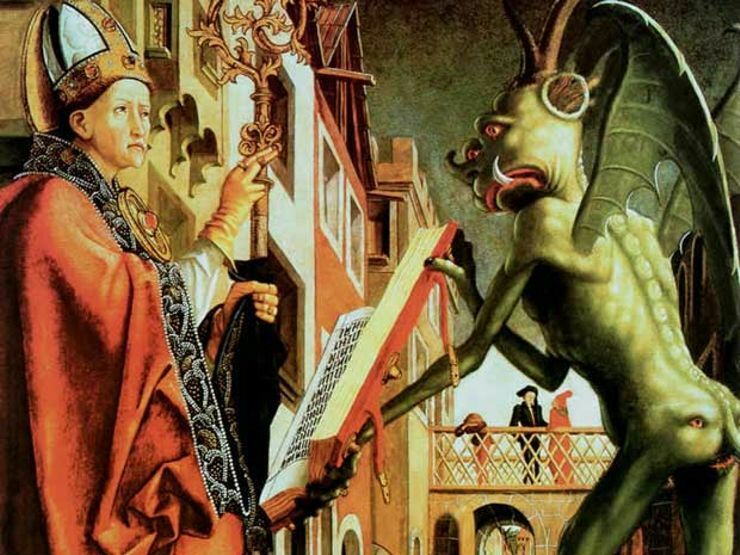 If the greatest trick the Devil ever pulled is convincing people he doesn’t exist, why is it the people who DO believe he’s real who often seem the most likely to compromise their morality? 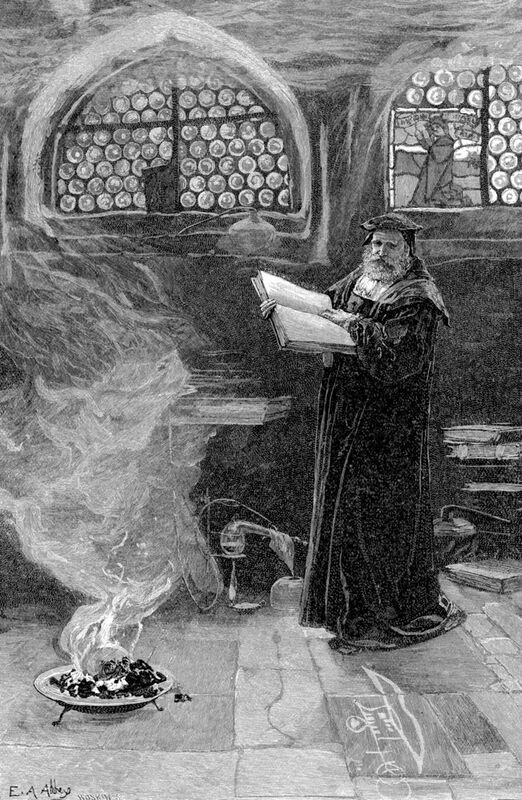 This entry was posted in Christianity, Focus on the Foes, Fundamentalism, History, Jack Chick, Magic, Mythology, Plays, Politics, Religion, Urban Legends and tagged contracts, donald trump, faust, folklore, heaven, hell, johann georg faust, johann wolfgang von goethe, repentance, satan, simon magus, sin, souls, st. theophilus of adana, tricksters. Bookmark the permalink. I love that last question! If I might be allowed a generalization or two for the sake of argument, I’d answer that question by saying it’s because the right are one of two primary targets of the Adversary. Here you have a group that tend to be, and partly through no fault of their own: a) undereducated in their faith (as well as in other areas) due to a terrible education and religious system, b) easily prone to being misled through years of the follow-your-leader mentality in schools and sports, and c) barraged economically and disenfranchised socially making them easier prey to political and religious wolves in sheep’s clothing. Now, on the other side, I think the left have a whole other set of issues that the Enemy (by which I mean not a single diabolical figure, but rather a whole host of fallen angelic beings) exploits. Here you have a group (again generalizing) that tend to be, and partly through no fault of their own: a) faithless, in that they have no clear understanding of the biblical worldview save for the gross distortions they’ve heard (or experienced) and rejected, b) “over” educated and arrogant due to a blind acceptance of (and allegiance to) what’s taught in academia so that they think they’re smarter than they really are, and c) financially and socially comfortable, so that there’s no interest/motivation towards spiritual matters, save for those seeking to be part of the trendy New Age counterspirituality. I said “partly through no fault of their own” in regards to the left and right because I was speaking of two collectives who have been societally conditioned in two distinct and different ways, however, I used the word “partly” because I think free will and personal responsibility are also important factors that need to be taken into consideration in that we are ultimately responsible for how we think and act, and to ensure that those two things are correct. If someone grossly fails in those areas, as many do, e.g., a man on the right beating to a pulp an abortion doctor, a man of the left beating to a pulp a fascist, then that someone is responsible for all that his thoughts and actions have produced. Those are extreme examples, but I think the notion of responsibility is yet true in less obvious ways, meaning that we must each overcome the societal conditioning imposed upon us, and if we have done that work, to help others do so, as well.